Listen to the podcast. Download the podcast. Listen on iTunes/iPod. Sponsor: Hewlett-Packard. Business intelligence (BI) has been a top investment for corporations in the past several years, but the ability for BI to generate value and strategic direction guidance is merely in adolescence. In health care, customer retention, energy and oil management, and for global risk reduction and compliance, BI is offering some of the best payoffs from IT and datacenter investments, says Rod Walker, vice president for information management at HP's Consulting and Integration group. 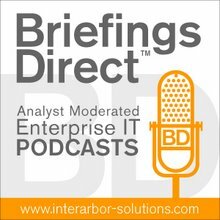 In this podcast discussion, Walker joins me to explore how BI will continue to be one of the most effective ways for business leaders to leverage IT over he next decade. Proper information management -- including all content in all forms, and not just structured data -- provides powerful market analytics and customer and user behavior inferences to enable real-time decisions about core services, product offerings and go to market campaigns. Listen to this BI business opportunity overview podcast recorded at HP's Software Universe event June 18, moderated by your's truly from Las Vegas. The Walker interview comes as part of a series of discussions with HP executives this week from the HP Software Universe conference. See the full list here.